I don’t have many photos of this, as I forgot about the camera when I was joining the plates for the cello. Not all instruments have a glue-seam down the centers of the plates, but most do, and especially most cello-sized instruments. 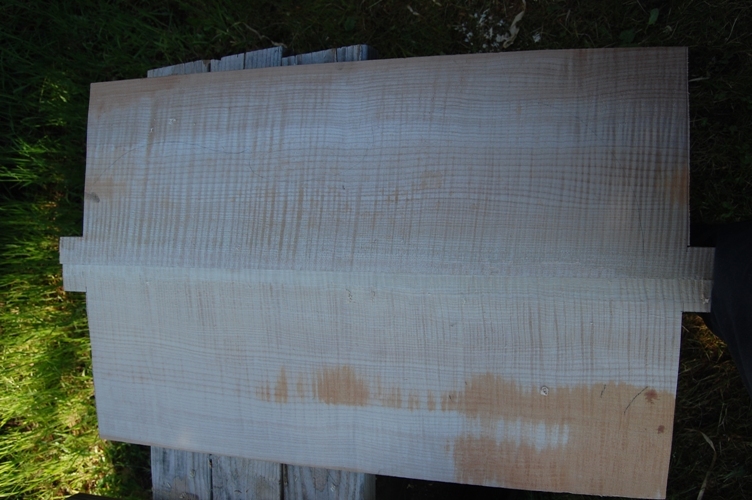 It is simply too difficult to find good tonewood that is big enough for one-piece backs. One-piece tops are available (especially if you use Sitka spruce, as the trees are huge), but nearly everyone uses two-piece tops. One reason is the idea that since we usually “book-match” the plates, (meaning that a pie-shaped wedge of a log is split lengthwise to make two very narrow pie-shapes, then the wide edges are planed and joined in a hide-glue seam, to make a cross-section similar to that of a low, double-pitched roof) the grain begins tight, both sides of the glue-seam, then broadens fairly symmetrically, as it extends toward the outer edges. I don’t know whether this really makes any difference, acoustically, but it looks nice. I used to do all my center joints with a #8 Stanley Jointer Plane (hand-jointer). That was a lot of work, and difficult to get it really flat. Now, on large instruments, I run the edges through a powered jointer first, to get the glue-seam as close as I can to being perpendicular to the inside plate surface. The jointer is a fast, reliable way to get close to a good joint, but I have never gotten a good enough joint JUST using the jointer that I could go ahead and glue the pieces together. I always end up using a good straightedge and a small, very sharp hand plane to fine-tune the joint faces until the fit is perfect– airtight. I check the full length of the face, at each edge and the center, then diagonally across the face, in both directions. If I have to, I use a scraper to remove very small humps. Once I have one plate perfect, I put the second one in a vise, and use the first one as a “try” surface–I run through the same routine with the straightedge, but then put the first glue surface on top of the second, and rotate it, to see if there are “pivot points” which indicate high spots. I use a scraper to bring those down until there seems to be an even friction all over, and an absolutely airtight, light-tight joint everywhere the two plates touch. 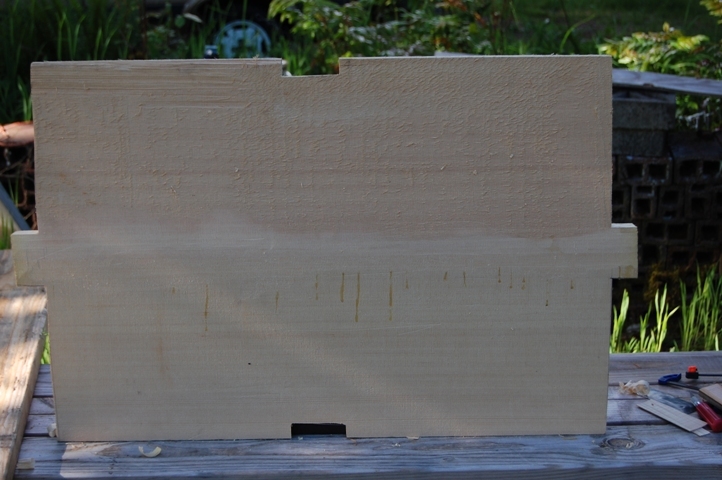 Some luthiers use a “shooting board” to get the same results. This is essentially a plane affixed at a 90 degree angle to a flat board, along which the instrument plate is pushed; the plane stays still, and the board moves. Then I saw out notches at the ends and (usually) in the center, near where the C-bouts will be, so that I can get clamps in three places. I try the clamping first (quite tightly) while the plates are dry– if the notches where the clamps sit are at a bad angle, they may force the plates apart rather than hold them squarely together. When I am ready to glue, and the hide glue is hot, a brush is ready to use, etc., I heat the gluing surfaces with a clothes-iron, until they are hot to the touch. Be careful on this step, as it is easy to scorch the plates–especially the spruce. Another way to do it is with a heat-gun or hair-dryer. I have one plate secured in a vise, and the other ready to match against it. With the plates hot, and the glue hot, (and pretty runny– not water-thin, but not viscous like honey– maybe more like thin syrup) I brush the glue liberally on both plates, then quickly match up the plates, rubbing the top one hard against the bottom, so that glue seeps out all around the edges. I want it to squeeze out everywhere. I only have a few seconds to get the joint tight, and lined up exactly right, because the glue quickly begins to gel, and then it will lock up. I line up the corners, then apply clamps at both ends. I take the plates out of the vise, and apply a bar-clamp to the center notch. Set it aside and allow it to dry overnight. It will actually be strong in much less time, but I REALLY don’t like to have center-joints fail, so I allow them to dry overnight. You will notice that in the two photos below, I did not center-notch the maple plates. I don’t recall why…sorry. This is a completed, book-matched joint in a Sitka spruce cello top. Sitka Spruce, from the Wood Well (tonewood dealers near Port Townsend, WA). This is a Big Leaf maple cello back, from the Wood Well, in Port Townsend WA. Thanks! I’m doing a cello right now and having trouble with the maple back. Have steamed it apart once and will again as it’s not good enough yet. I just have a No.5 plane that I have carefully flattened, but may have to invest in a longer one, I note you have an 8. Thanks for your detailed description, it’s exactly what I have done, so I will try yet again with even more care. What exactly seems to be wrong? Not a tight enough joint? Is it possible that (a) your glue is too thick, or (b) your wood is not warm enough? Either will make a visible joint, because the glue gels between the plate edges instead of being squeezed out flat and thin. Be aware, too, that as the glue continues to dry, it shrinks, and the seam becomes a little tighter (not a lot, but some).